If you are interested in joining the Watson Lab, there are a range of potential project topics available, but I am also open to discussing other opportunities to collaborate. For information about scholarships and enrollments in the CSU PhD program, click here. You should also read my manifesto regarding expectations (yours and mine) regarding research students. The use of call playback for birding. For many years, playing pre-recorded calls has been used as a survey tool by ornithologists, determining occurrence patterns of rails, owls and other elusive species by tricking them into responding to a perceived intruder. With the rise of smartphones and a growing number of bird ID apps that include calls, the use of call playback is now commonplace in recreational birding. Many regard this practice as necessarily bad, but we know very little about the practice; in terms of both the motivations of birders / birding guides and the effects on birds themselves. Two integrated projects looking at these related aspects are currently available. Cinnamon quail thrush photographed during a creekline survey in Sturt National Park. Drivers of arid zone bird occurrence across space and time. Since 2002, I have been undertaking bird surveys along a series of creeklines in Sturt National Park in the far northwest corner of New South Wales, and Andrew Ley and colleagues have undertaken extensive surveys to establish habitat preferences and distributional ecology of birds in nearby Diamantina National Park, Queensland pdf. 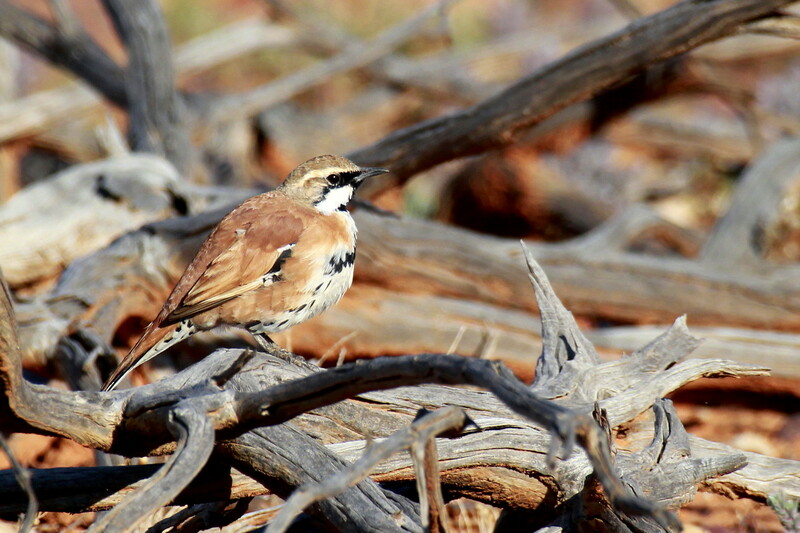 There are many open questions regarding determinants of arid zone bird occurrence, some of which could be addressed using data already in hand, others which would require targeted fieldwork. 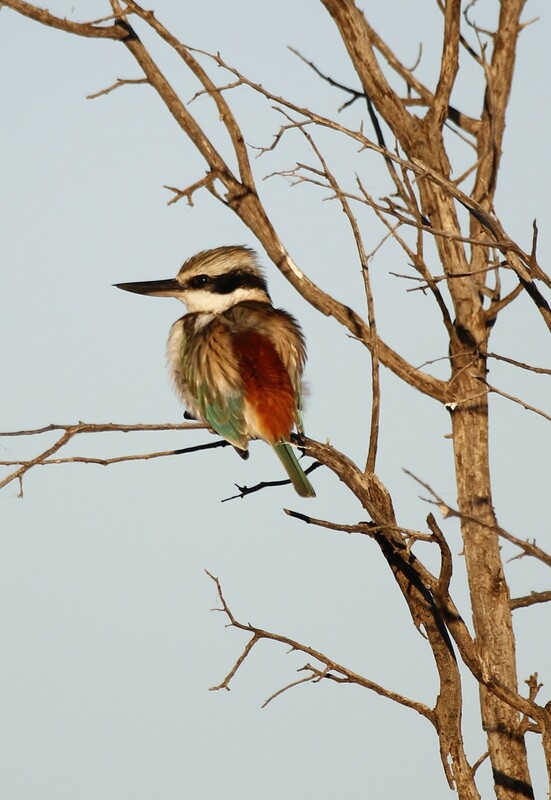 Red backed kingfisher at Mt Wood, photograph by Tom Rambaut. Host specificity in tropical mistletoes. Although exhibiting their greatest diversity in tropical forests, mistletoes are characteristically rare in tropical regions. Does mistletoe abundance and host specificity relate to host preference and underlying patchiness in host availability, distribution patterns and micro-habitat preference of seed dispersing birds or the non-random behaviour of mistletoe-munching natural enemies? There are numerous opportunities to evaluate these questions, both in northern Australia but also in southern Costa Rica. Host-mimicry in Australian mistletoes. Many mistletoe species look uncannily similar to their principal hosts and, although noted by many ecologists, many questions remain regarding the evolutionary basis and ecological drivers of this pattern. Rather than herbivores, seed dispersing birds may be involved—mistletoes resembling their hosts are harder to discern in woodland and forest canopies. 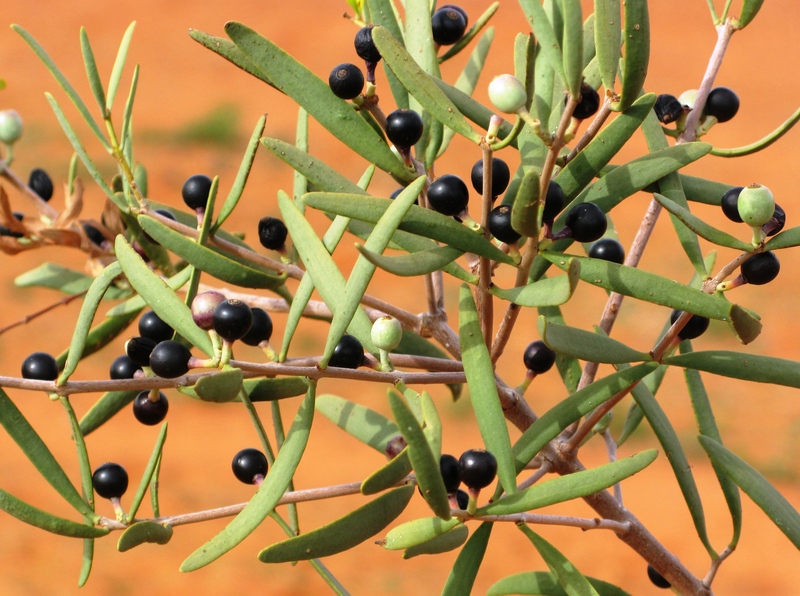 One way to test this idea would be to determine the foraging cues used by generalist and specialist foragers in their quest for mistletoe fruit, and compare strategies used on cryptic mistletoes with those used on visually-contrasting mistletoes. Nutritional ecology of declining woodland birds. Building on previous work that determined the dietary preferences of this group of ground-foraging insectivores, numerous questions remain unaswered. Do dietary preferences and nutritional profiles of consumed prey vary between stable and declining populations of selected insectivores? Are particular minerals or amino acids limiting in the diets of these birds, and which prey types have the greatest amounts? Remote monitoring of resource availability. Occurrence patterns of many organisms are driven by resource availability, but measuring resources in remote places or across large areas poses many challenges. As part of ongoing research on acoustic monitoring, this project will evaluate whether the vocalizations of visiting birds can be used to quantify whether fruit or nectar are available at a particular site, and whether additional information (on the spatial and temporal extent of resource availability) can also be inferred. Measuring arrival/departure times for migratory species. The direct and indirect effects of climate change on migratory species are being increasingly reported, but estimating arrival times and departure times are difficult in areas with few observers, including vast areas of Australia. By using data from fixed acoustic monitoring stations, semi-automated approaches to identify species and using crowd-sourcing to assist in discerning particular calls, baseline data for selected species (likely colonial seabirds and cuckoos) will be collected in key regions of eastern Australia, enabling changes in the tempo of migration to be detected. Flowers to die for—do floral traits affect herbivory? Most studies of flower evolution consider pollinators as the predominant force affecting plant fitness, but other factors may also be involved. Many herbivores rely on visual and olfactory cues to find their preferred food plants—might they also play a role in constraining flower size, colour or overall ‘attractiveness’. Using a series of comparisons between species with different floral traits, this experimental study will determine whether herbivores (mammals and insects) are more likely to find plants with particular kinds of flowers. This project will be co-supervised by Adrian Dyer at RMIT. Beating the heat—how does flower colour affect thermal tolerance of plants? As well as affecting attractiveness to pollinators, flower colour interacts with temperature to influence plant growth and survivorship. But, how do these two selective forces interact—does flower colour reflect pollinator preferences, thermal adaptations or a compromise between the two. In this study, flower colour of Australian mistletoes will be explored relative to climate and pollinators, modelling the interactions between pollinators and climate using distributional data and testing predictions with a series of comparisons between genera, species, and colour morphs within species. Introduced predators (cats and foxes) have had a devastating impact on Australian animals, driving many species to extinction. But what effect have they had on overall food webs, and what does this mean for community dynamics? This project will be based in the Little Desert, comparing occurrence patterns of animals either side of two large predator-proof exclosures installed in 2002. Using trapping and active searches, the ground-dwelling fauna will compared in areas with and without feral predators to measure the effect exotic predators have on food webs and determine which groups of animals are most sensitive to changes in predation pressure. This project will be carried out in partnership with the FAUNA research alliance and all project costs will be covered.